In Vitro Transcription and Capping of Gaussia Luciferase mRNA Followed by HeLa Cell Transfection. Jani, B., Fuchs, R. J. Vis. Exp. (61), e3702. Efficient Genome Editing with Cas9 mRNA + Guide RNA Oligonucleotides. HEK293T/17, U2OS and NHDF cells were co-transfected with 0.5 µg of Cas9 encoding mRNA, 5meC, ψ (Trilink Biotechnologies) and 25nM of PPIB targeting 2-part gRNA (Dharmacon) using TransIT®-mRNA Transfection Kit (0.5 µl/well of 24-well plate of both mRNA Reagent and Boost, Mirus Bio). A T7E1 mismatch detection assay was used to measure cleavage efficiency at 48 hours post-transfection. 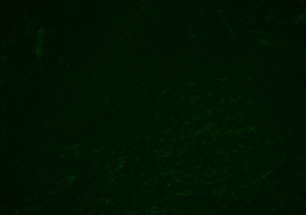 High Efficiency and Low Toxicity Transfection Following 14 Consecutive Transfections with TransIT®-mRNA Transfection Kit. 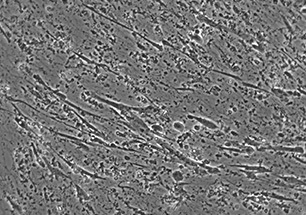 Repeated daily transfections were performed in the same population of BJ fibroblasts using TransIT®-mRNA Transfection Kit, Lipofectamine® RNAiMAX (Life Technologies) and Stemfect™ RNA Transfection Kit (Stemgent) - with a capped and polyadenylated EGFP mRNA incorporating pseudouridine and 5mC modified bases (Trilink Biotechnologies, Inc.). Multiple reagent-to-RNA ratios were tested and the optimal ratio is represented. 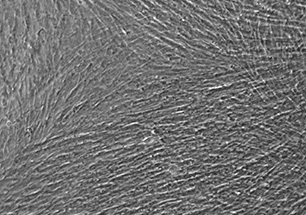 Transfections were performed in 12-well plates using the indicated reagent-to-RNA ratios to deliver 1 µg of RNA.  GFP and phase contrast images were taken in the same field of view everyday after transfection. Transfection efficiency was measured by flow cytometry on a Guava® easyCyte™ 5HT following 14 consecutive daily transfections (blue bars). 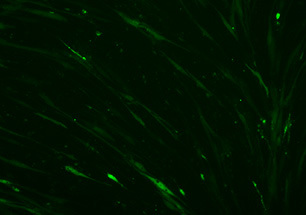 Cell viability was determined using cell counts measured during flow cytometry (black line grey bars). Error bars represent the standard deviation of triplicate wells. 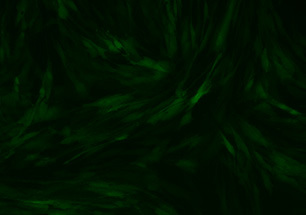 TransIT®-mRNA Transfection Kit Transfects GFP mRNA into DC 2.4 Dendritic Cells. 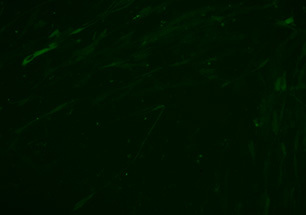 Using TransIT®-mRNA Transfection Kit, DC 2.4 cells were transfected with (A) 0.5 µg, (B) 1 µg and (C) 2.5 µg of capped and polyadenylated mRNA encoding GFP with 1 µl TransIT®-mRNA Reagent and 1 µl Boost. Cells were seeded overnight at 100,000 cells/well in 24-well plates. 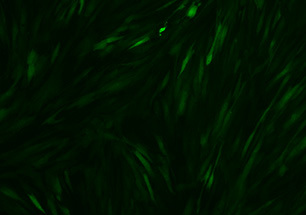 Images were taken 10 hours post-transfection. 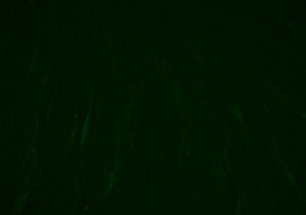 Multiple Dendritic Cell Types Express GFP from mRNA Transfected by TransIT®-mRNA Transfection Kit. 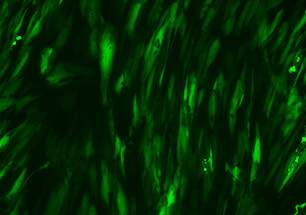 Murine primary bone marrow derived dendritic cells (BMDC) and murine dendritic cells types (JAWSII and DC 2.4) were transfected with 1 µg of capped and polyadenlyated mRNA encoding GFP using a TransIT®-mRNA Reagent: Boost: mRNA ratio of 1:1:1 (µl:µl:µg). Primary BMDCs, JAWSII and DC 2.4 were seeded (80,000 cell/well) overnight in 24-well plates. 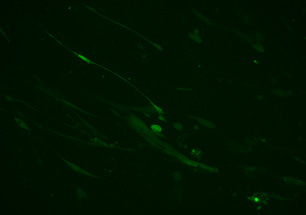 Cells were assayed via flow cytometry 8 hours post transfection. Error bars represent the standard deviation of at least 3 separate experiments. 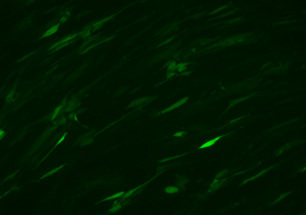 High Level Luciferase Expression after Delivery of a Luciferase mRNA Using TransIT®-mRNA Transfection Kit. 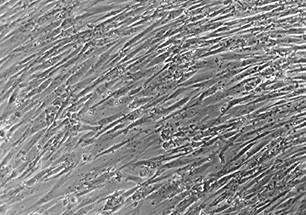 Cells in 12-well plates were transfected with a capped and polyadenylated mRNA encoding luciferase using the TransIT®-mRNA Transfection Kit. 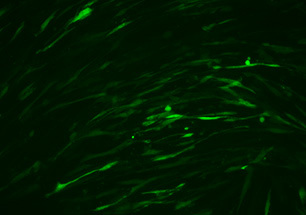 Approximately 18 hrs post-transfection the cells were harvested and the total luciferase activity per well was determined. TransIT®-mRNA Transfection Kit Efficiently Delivers lacZ mRNA to CHO-K1 Cells. Using the TransIT®-mRNA Transfection Kit, CHO-K1 cells were mock transfected (A) or transfected with a capped and polyadenylated lacZ encoding mRNA (B). 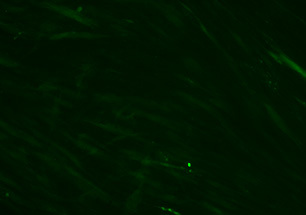 Approximately 18 hrs post-transfection the cells were stained using Mirus Bio’s Beta-gal Staining Kit to identify the lacZ transfected cells. NEW! In vitro Transcription and Capping of Gaussia Luciferase mRNA Followed by HeLa Cell Transfection. Jani, B., Fuchs, R. J. Vis. Exp. (61), e3702. Our lab recently used theTransIT-mRNA Transfection Kit to show that intracellular delivery of HPLC-purified and pseudouridine-containing mRNA can translate very efficiently without immune activation which is ideal for mRNA-based gene therapy applications. TransIT®-mRNA further facilitated this work through low toxicity transfections of HEK 293T, human dendritic cells (DCs) and primary keratinocytes (Karikóet al. Nucleic Acids Research, 39:e142, 2011).